Hornindalsvatnet is Norway's and Europe's deepest lake, officially measured to a depth of 514 metres (1,686 ft). Its surface is 53 metres (174 ft) above sea level, which means that its bottom is 461 metres (1,512 ft) below sea level. The village of Grodås lies at the eastern end of the lake in Hornindal Municipality and the village of Mogrenda is located on the western end of the lake in Eid Municipality. The European route E39 highway runs near the lake. The village of Heggjabygda and Heggjabygda Church lie on the northern shore of the lake. Its volume is estimated at 12 cubic kilometres (2.9 cu mi), its area is 50 square kilometres (19 sq mi) and ranks 19th in area among Norway's lakes. It is located in Sogn og Fjordane county, about a kilometer south of the county border with Møre og Romsdal county. The lake lies within the borders of Eid and Hornindal municipalities. The main outflow is the river Eidselva, which flows into the Eidsfjorden, an arm off the main Nordfjorden. 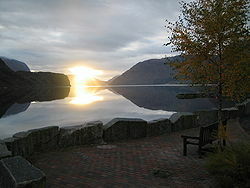 The lake is also the site of the Hornindalsvatnet Marathon, held annually in July. ^ Seppälä, Matti (2005). The Physical Geography of Fennoscandia. Oxford University Press. p. 145. ISBN 978-0-19-924590-1. ^ "Hornindalsvatnet Maraton" (in Norwegian). Archived from the original on 2010-08-18. Retrieved 2010-07-11. This page was last edited on 8 April 2017, at 14:34 (UTC).